Photo Credit With 100 continuous miles of trail open in Pennsylvania from McKeesport to Meyersdale and an additional twenty miles scattered throughout the Pittsburgh area, the Great Allegheny Passage is the longest multi-purpose rail-trail in the East. The rail-trail offers a total of 150 miles of non-motorized, nearly level trail between Cumberland, Maryland and Pittsburgh, Pennsylvania with a 52-mile spur to Pittsburgh International Airport. At Cumberland, the Passage will link with the Chesapeake & Ohio Canal Towpath, creating a 300-mile off-road route between Pittsburgh and Washington, DC. 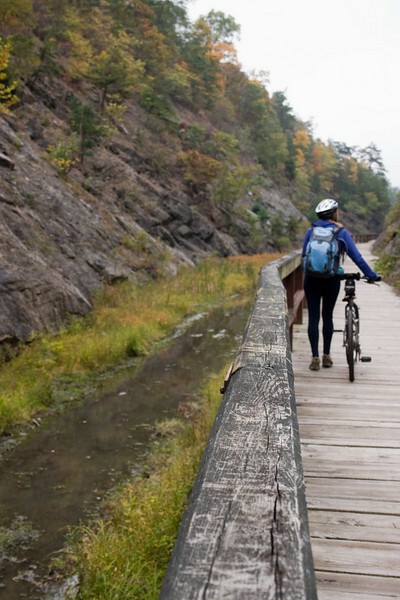 The Great Allegheny Passage allows hikers, bicyclists, cross-country skiers and people with disabilities the opportunity to discover the region's spectacular river gorges, mountain vistas and sweeping cityscapes. The Passage leads travelers through the Allegheny Mountains making use of refurbished railroad bridges and tunnels on their journey along waterways, unique rock formations, and wildlife areas. The trail was completed with the help of a $4 million TE grant. A public-private partnership between the Pennsylvania Department of Transportation and the Allegheny Trail Alliance (a coalition of seven trail organizations in Southwestern Pennsylvania and Western Maryland), manages this comprehensive project and has significantly contributed to the project's success.